You've been using Microsoft's products for a while now - Office, Exchange, SharePoint, Skype. You know how to use them, what they do. Here are a few you probably haven't used. Some are really interesting and different than what you normally expect from Microsoft. Some are actually free! Are you bored with PowerPoint? Need to create a quick and easy visual presentation on the web? 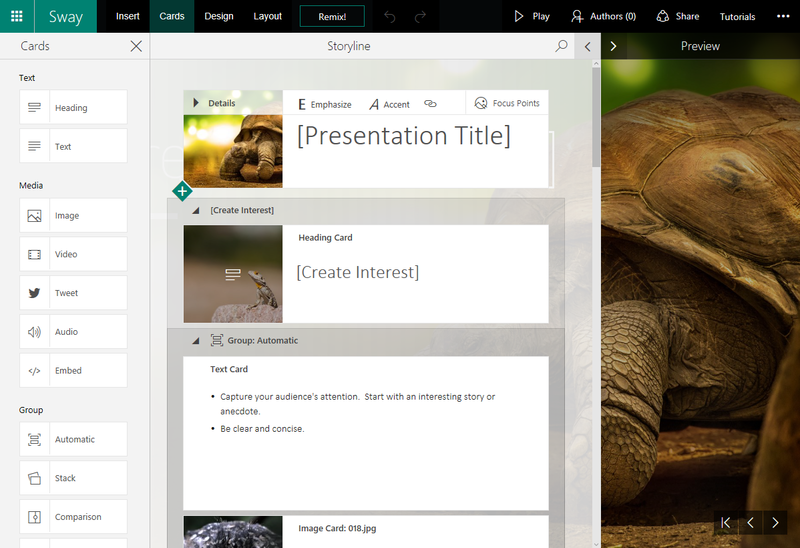 Log in with your Microsoft Account at Sway.com and you can create a visually stunning presentation quickly and easily. Choose a template then develop your story line with text, pictures and rich media easily - video, audio, Tweets and more. Invite someone to co-create your Sway or review it if you like, then when you're done if you don't like it, hit the Remix button to give it a new look. When you're done hit the Share button to share it on Facebook or Twitter or upload it to your public gallery on Docs.com. Sway is free with a Microsoft account. You can also get free Outlook.com mail and free OneDrive storage with that same account. Go to live.com to get an account, but most people have one already. Have you ever missed an e-mail from your boss? Are you tired of posting updates twice - once to Twitter and once to Facebook? Maybe you'd like to automatically save your e-mail attachments to SharePoint. 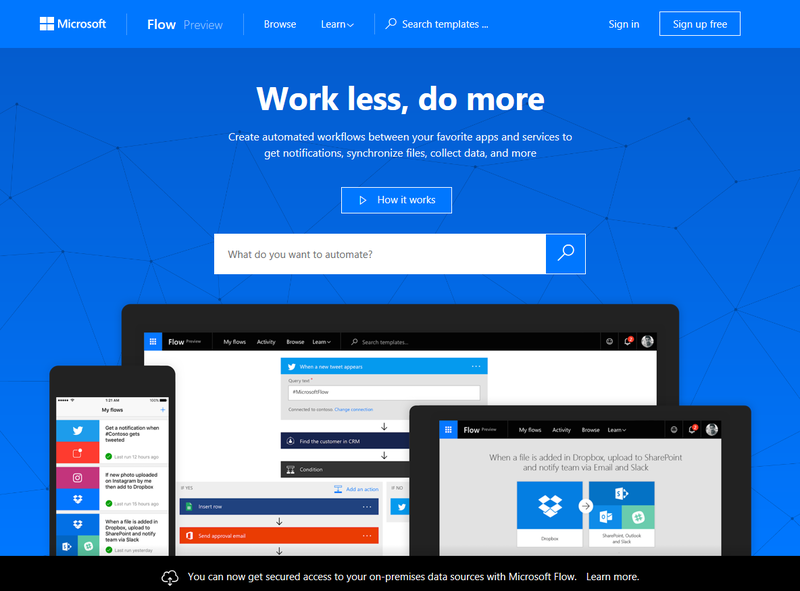 You can do all this and more with Microsoft Flow. Flow has dozens of pre-created automations already built that you can use, or create your own from a selection of "triggers", conditions, and actions. Receive e-mail from Bob > Create a Wunderlist task > Add the subject from Bob's e-mail as the Title for a new Wunderlist task. If you're a geek like I am and have played with home automation, Flow is a lot like IFTTT (If This then That) but for business. It's a cool concept and it will be interesting to see what people come up with. Flow is another free service from Microsoft and just requires an account. Sign up at live.com. BONUS: Check out Wunderlist - its a great (and free!) to-do and personal planning app for the web and most mobile devices. Wunderlist is a part of Microsoft as well! Thank you Satya! 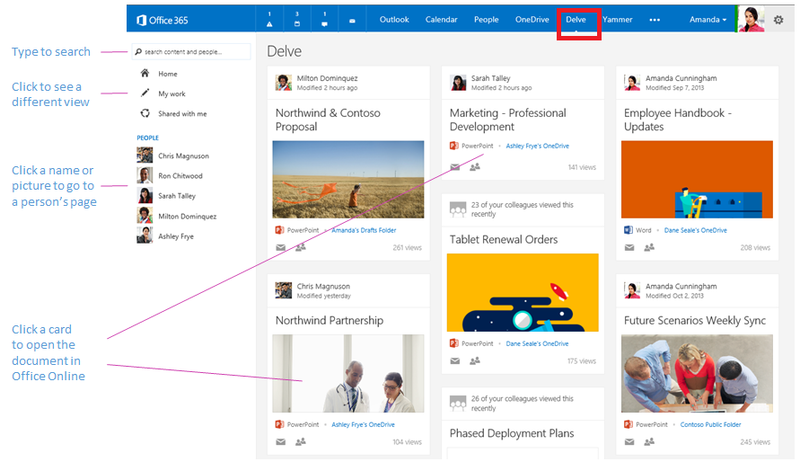 For those business users already on Office 365 with files in OneDrive and SharePoint, Delve provides a way to share and discover documents, subject matter experts, groups, and more... all based on your own preferences, content and existing contacts and groups. Delve lets you "favorite" boards and documents to enable easy recall of content you discover. The feature is quite similar to what you see in Pinterest. For instance, if you share a lot of documents with your marketing team and they publish a new design style guide or PowerPoint template to the public, you can go to Delve and quickly see the new doc without having to go search for it on SharePoint. Dive in to MyAnalytics (with an additional license) - get details about how you use your time, who you should stay in touch with, set goals for how to manage your day and more. Access Delve from within your Office 365 portal at portal.office.com. You can open it from the "Waffle" menu in the upper-left-corner if you have access. Requires an appropriate Office 365 subscription. Need to get organized but think Microsoft Project is overkill? If you have Office 365, Planner goes hand-in-hand with Office 365 groups to allow for easy team collaboration on tasks with light project management tracking and metrics. If you're familiar with kanban boards and cards, Planner is very similar. You Create a task or card on one of several boards. The boards organize the cards either in to categories or as a reflection of process or backlog for items to do. You can use Planner to assign tasks to team members and then easily track status of all tasks in the Chart view. Planner is closely tied to Office 365 Groups and you can manage a Notebook, store files, share a Calendar and even use the Conversations view to discuss progress of your project. Office 365 Groups could (and probably will!) be an entire blog of its own. There's lots to like there. Like Delve, Planner requires an Office 365 subscription and appropriate access to be granted. Microsoft has moved to a cloud-first model. You see innovative applications like these popping up regularly now. There will likely never be a full on-premises Office client for any of these applications but they are all built to work well on mobile devices, may be integrated in to other Microsoft apps and may show up in the mobile app stores as well. The cloud allows Microsoft to quickly develop and market test applications and those that catch on will stick around while others may fall off. You can be sure of one thing, though... you'll see more of these and some may look strange if your only experience with Microsoft is Office.